See the current Inventory & Price List for seedling sources and availability. Further seed source info and scientific names are available by contacting the nursery. Many of our species are produced from MITOSIS seed. MITOSIS is the Montana Interagency Tree and Shrub Improvement Study. The study was a cooperative effort to evaluate the performance of various species of plants in established Montana plantings. The selected plantings were evaluated for over ten years and the best performing plants were selected for seed orchard establishment at the nursery. We use this seed source whenever possible. These selections perform well in many of Eastern Montana's variable and harsh climates. Although these plants have not been tested in every environment, MITOSIS selections are some of the best plant materials available for use in Montana. The selections are proven to survive in Montana because they were evaluated in Montana not other Northern Great Plains states. Windbreak Spacing 8-14' Minimum Annual Precip. 14"
Comments Drought tolerant once established but grows best on good sites. Use for reforestation and windbreaks. Windbreak Spacing 6-12' Minimum Annual Precip. 10"
Comments Excellent in wildlife plantings. Very drought and alkali tolerant. Transplants well. Genetically selected seed for cold hardiness and faster growth. Windbreak Spacing 8-14' Minimum Annual Precip. 15"
Comments Prevalent in western Montana on mid elevation slopes. Rapid growth on good sites once established. Commonly used for reforestation. Windbreak Spacing 8-14" Minimum Annual Precip. 12"
Comments A good tree for windbreaks, will not drop lower branches. Adapts well to many soil types. Comments Very hardy and slow growing. Use where other evergreens can't survive. Elevations will be lower west of the Divide. Comments Used mostly for reforestation and reclamation of dry, high altitude sites. Windbreak Spacing 8-14' Minimum Annual Precip. 11"
Wildlife Value Birds and small mammals eat seeds. Provides some cover. Pests Western gall rust, commandra rust, pine beetles. Comments The selected seed source is adapted to eastern Montana. Drought tolerant. Wide usage for windbreaks and reforestation. Comments Great tree for reforestation as well as windbreaks. Choose seed source and elevations that best fit planting site. Drought tolerant. Windbreak Spacing 8-14' Minimum Annual Precip. 12"
Comments Adapts well to lower elevation sites. Fast growing conifer. Uses - Christmas trees, windbreaks. Windbreak Spacing 8-12' Minimum Annual Precip. 14"
Wildlife Value Birds and small mammals eat seeds. Provides some cover. Pests White Pine Blister Rust but we only grow from blister rust resistant seed. Comments Once common in far Western Montana but many killed by Blister Rust. Our seed source is Blister Rust resistant. 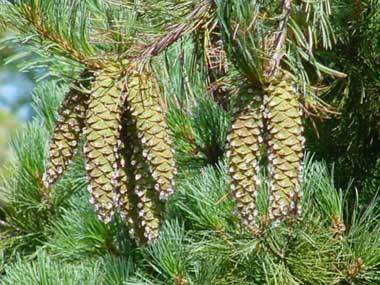 A beautiful five needle pine. Windbreak Spacing N/A Minimum Annual Precip. 24"
Comments Shade tolerant native tree found on low elevation moist sites with cool summers and mild winters. It occupies moist canyons and flats and does not do well on open dry sites. Comments Dense crown is good for windbreaks, slow initial growth, color varies from green to slightly blue. Comments A high elevation tree, needs more water at the lower end of the elevation range. Used for reforestation and reclamation of high elevation, wet sites.